No 330. 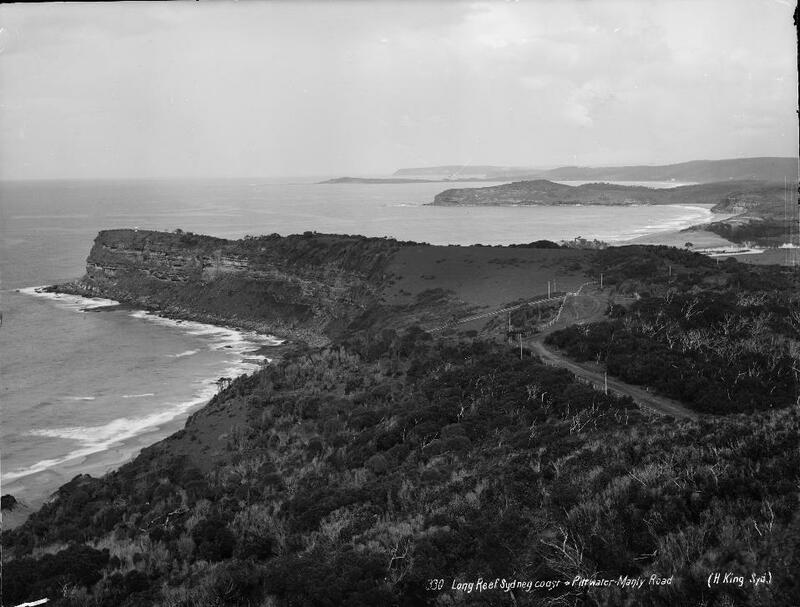 'Long Reef Sydney Coast, Pittwater - Manly Road' - this is actually Bungan Beach looking south towards Mona Vale and Long Reef from Bushranger's Hill. by Henry King, circa 1880. The enlarged sections shows what was called the 'Black Swamp' at M.V. 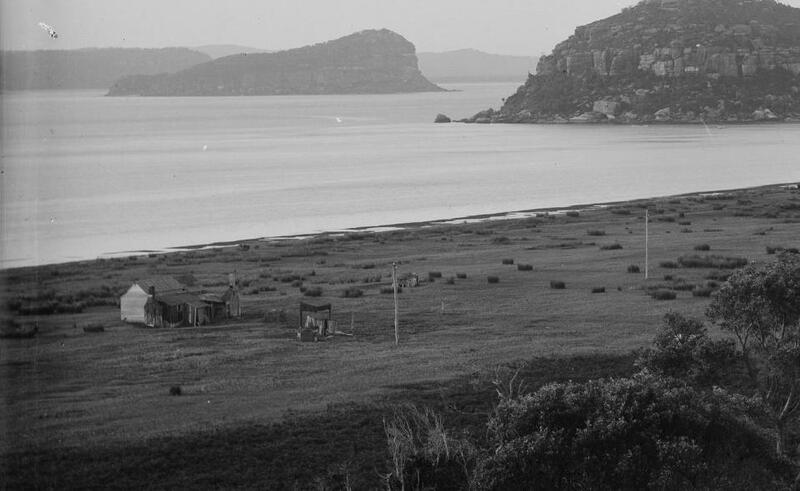 Note the Telegraph poles and wire - A Telegraph apparatus was established at Barrenjoey in the Customs Station in 1869, the first Telegraph Officer being Customs (waiter) Officer Albert Thomas Black - it's main purpose being, as stated then, "to record and report shipping entering or leaving the Hawkesbury Pittwater - and report any wrecks", as well as keep an eye out for any potential smugglers, although these had been curtailed since the establishment of the Customs Station. 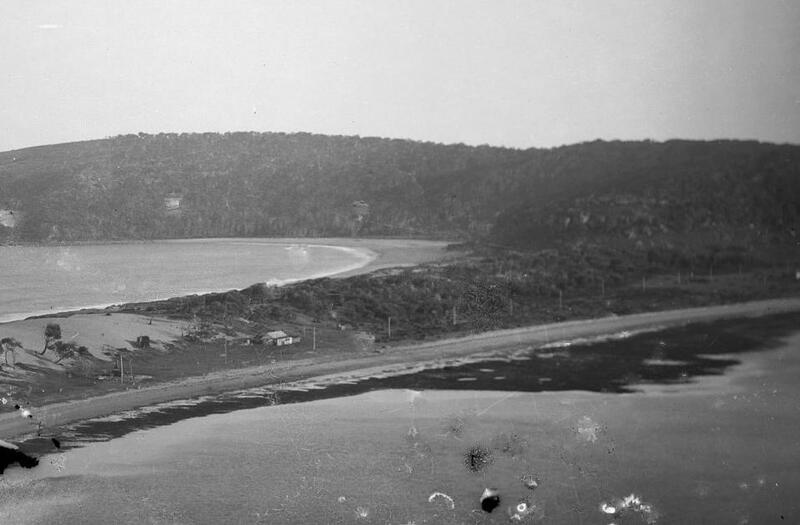 Many of the reports from Barrenjoey also referred to weather conditions - listing vessels in Pittwater and staying there for shelter. Photo from and courtesy the Museum of Applied Arts and Sciences (MAAS)- which houses over 1000 Henry King Images. Henry King (1855?-1923), photographer, was born at Swanage, Dorset, England, eldest son of William Isaac King, stonemason, and his wife Eliza, née Toms. Swanage is a seaside town in The Isle of Purbeck. Dorset is 10 miles S.E. of Wareham. Since Roman times Swanage was the centre of the local stone industry becoming a quarry town and harbour from which Purbeck marble was shipped. THE arrival of the Kate, from Plymouth, with Government immigrants, will afford a temporary relief to the late very great scarcity of country labour. The immigrants are classified as follows: 49 married couples, 105 single men, 62 single women, and 47 children. In the early part of the week, the rates going were, in some cases, slightly in advance of the previous week. OLIVER STAINES, British and Foreign Labour Agent. December 26. 73, corner of King and Castlereagh streets. ENGAGEMENTS have been limited in consequence of its being a holiday week. Orders for country servants continue plentiful. There has been one arrival (the Kate) with 300 immigrants of a mixed class. The harvest, now drawing to a close will cause reaction in the supply of labour. The inhabitants of Sydney have been much inconvenienced in regard to female servants, the demand is great, and those for hire very few. Wages remain firm at quoted rates. December 26. 48, Pitt-street North. KING ALICE S 2322/1872 WILLIAM ELIZA SYDNEY - ? 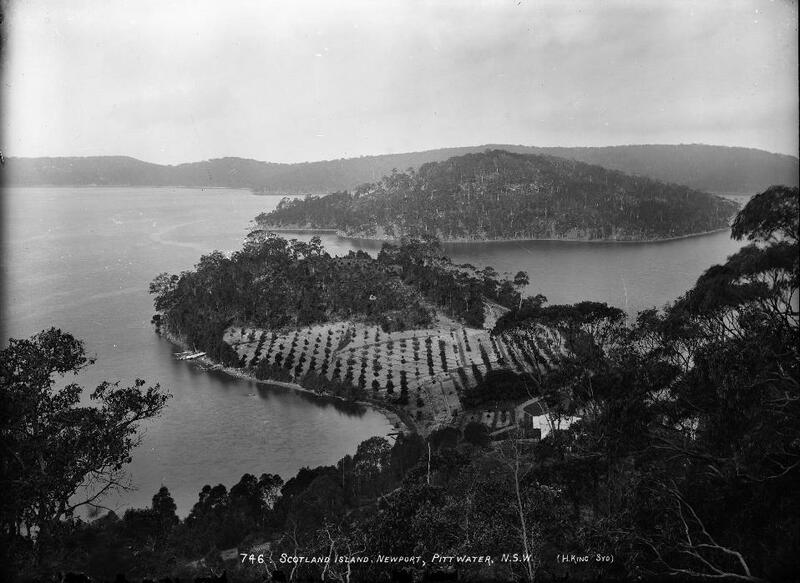 As a lad worked with the Sydney photographer J. Hubert Newman, serving an apprenticeship. 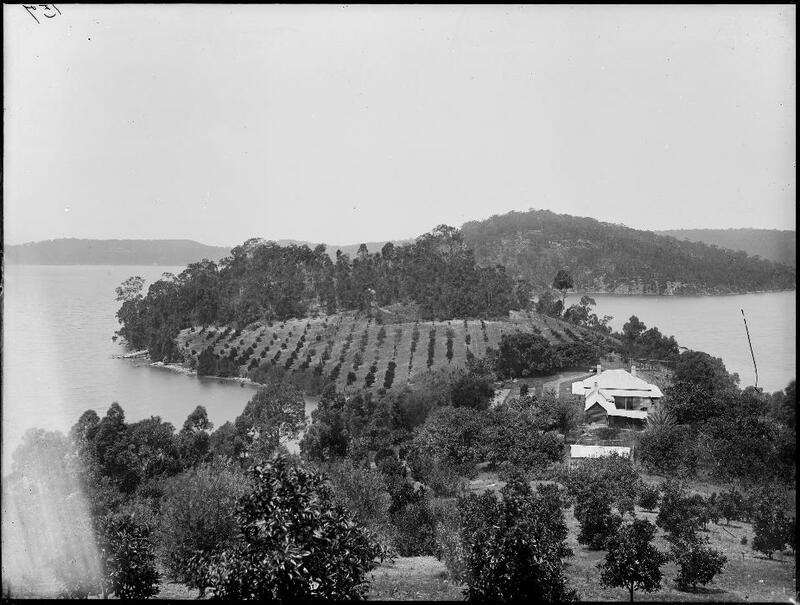 John Hubert Newman was born in Sydney, the son of a Master Builder. His brother, E.O. Newman, worked with him as a portraitist and colourist in the 1870s and he employed other studio assistants and apprentices to take and colour photographs (and possibly paint portraits), including John Hood and Henry King. On 27 November 1878 he married Elizabeth Laing (born 1857 to Robert and Racheal Laing) in Sydney with Congregational forms. Elizabeth's father was also a stonemason. In 1878 King established a photographic studio at 330 George Street in partnership with William Joseph Slade and by May 1882 was sole proprietor when Slade departed to set up a studio at Newcastle. For the rest of his life he worked from studios in George Street, although much of his reputation was derived from work done outside - his brilliant landscapes. 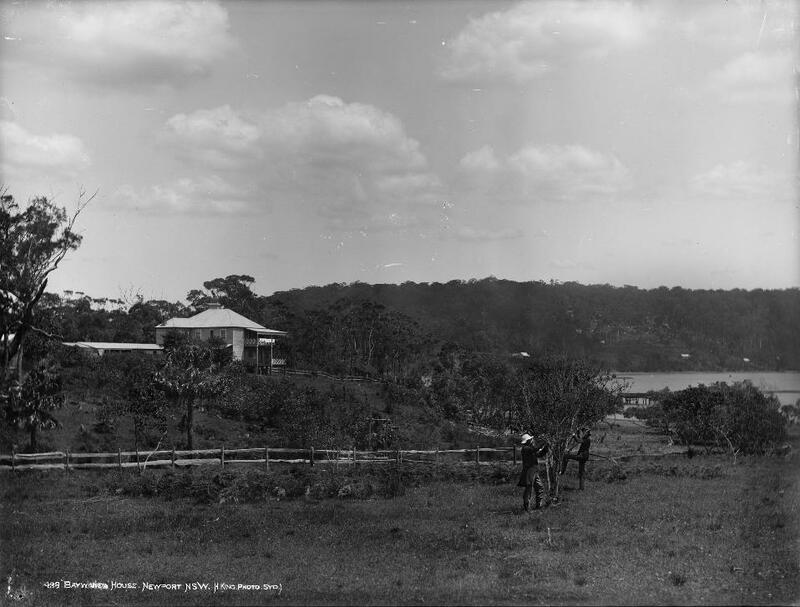 The above referred to New Guinea images were taken by Reverend W.G. Lawes of people and scenes photographed in New Guinea and islands of the Pacific. King, however, composed his portraits differently. Rather than placing them in a scene, each portrait was a head and upper-body composition with a blank background. They are totally removed from any context, allowing the viewer to concentrate on the facial features and body scarification that was often highlighted in the photographs. Early portraits were done in studio partly because of the technological limitations of the wet-plate process. Once dry plates were introduced to the region in 1880, it was easier for studio and amateur photographers to travel beyond the limits of the studio, exploring the rural landscapes surrounding the urban centers. 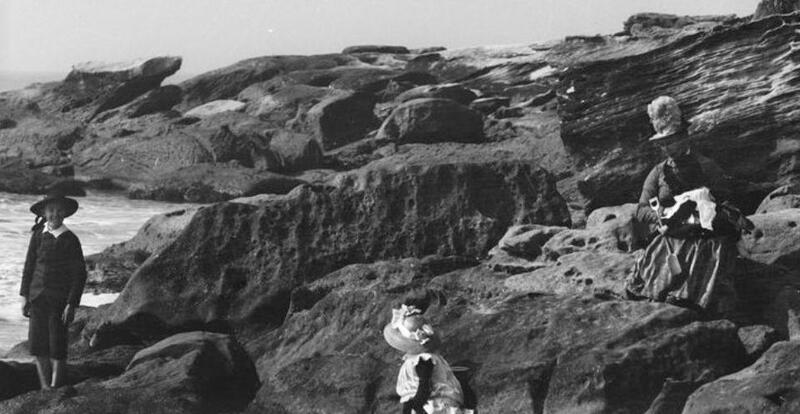 Landscape views were produced and marketed to show the uniqueness and “exotic” qualities of the Oceanic lands. Images of fern tree gullies, like that in Figure 1, were common, as the sheer size of the vegetation was considered primordial and mysterious. Another common subject was closer to home: urban street views, civic monuments and parliament buildings in Sydney and Melbourne that show the progress of the relatively 31 young nation. Both the landscape and city views were presented to a local and international audience in order to show characteristic views of Oceania and present an image of progress, developing a sense of pride for the country. Both of these subjects – the “exotic” landscape and urban development – can be found in the Oceanic Collection. 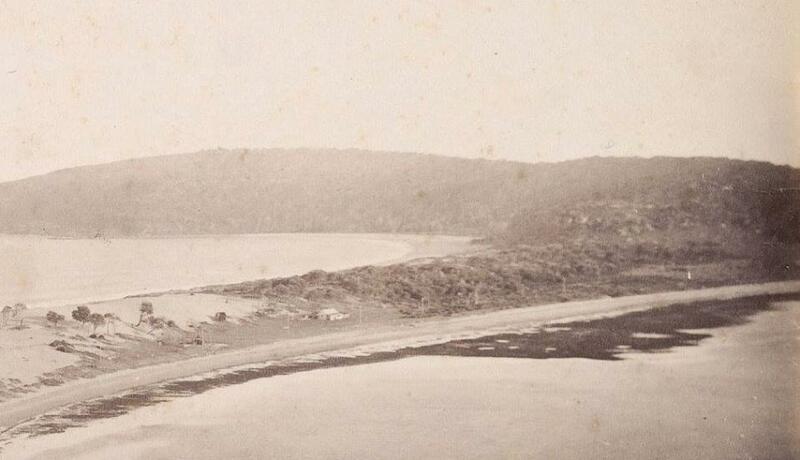 King would later use the dry plate process to photograph the Sydney streets and Australian landscape. from - Lomore, Cassie, "Finding Oceania : organizing a collection of Oceanic photographs and albums at the Art Gallery of Ontario" (2012). Theses and dissertations. Paper 1516. His portraits, mostly half length and identically posed, were often taken against a painted studio backdrop of the bush. At the World Colombian Exposition at Chicago in 1893 he was awarded a certificate and a bronze medal for the size, technique and artistic finish of his Aboriginal portraits. 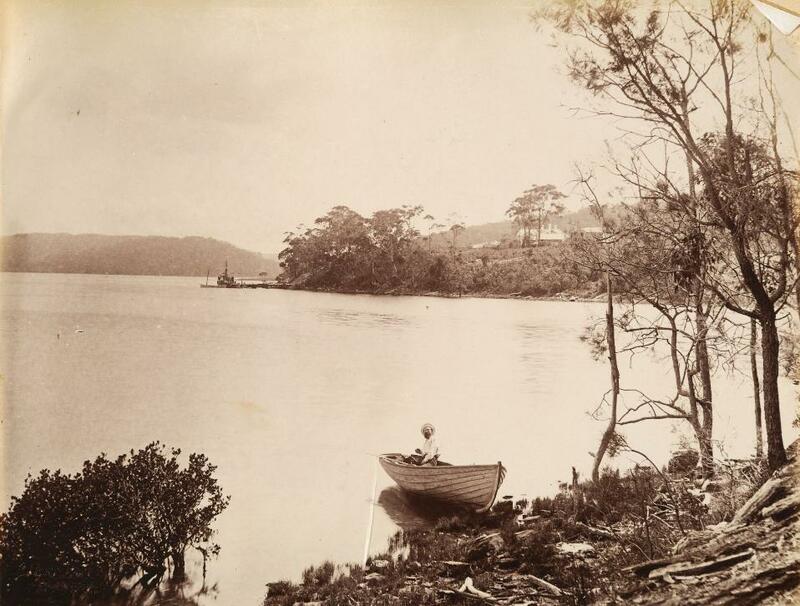 As his career progressed, and with the invention of dry-plate techniques, King turned more to landscape photography, producing as well as popular scenic views a series of Sydney street scenes, now valued for their historic as well as their artistic interest. 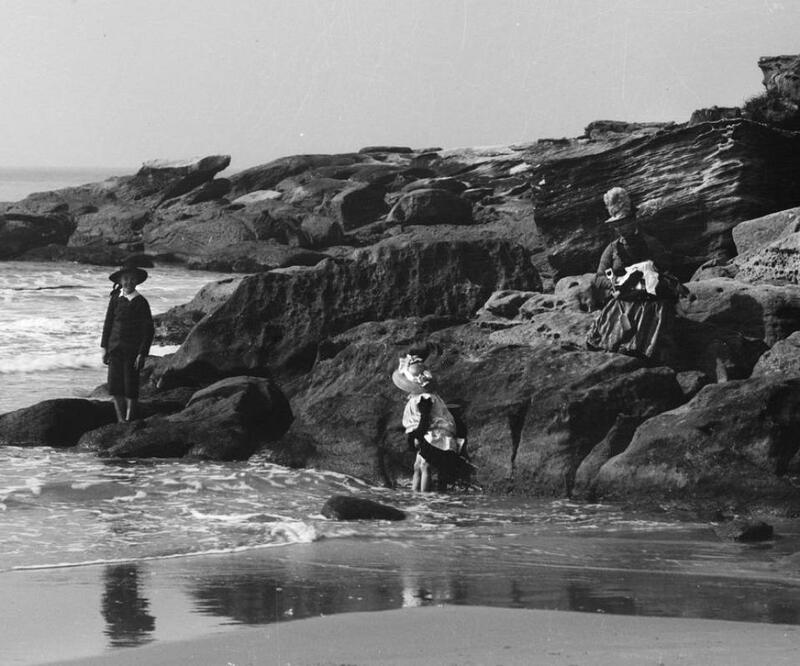 During the first decade of the twentieth century Mr. King carried out photographic work for the National Art Gallery of New South Wales and for several art societies. He counted many artists among his friends. His photograph of the 1907 selection committee of the Society of Artists, Sydney, featuring Julian Ashton, Will Dyson, Norman Lindsay, Sydney Long, D. H. Souter, Rose Soady (Lindsay) and Harry Weston, has often been reproduced. 'Mr King is a photographer of the old and new schools combined, and stands high in the esteem of the craft, and by amateurs he is regarded as a true and valued friend'. He was active in the N.S.W. Photographic Society and always encouraged amateurs - thus the tribute above. The annual exhibition of the New South Wales Photographic Society, which has been thrown open this year to intercolonial competitors, was officially opened at the rooms of the Art Society, 70 Pitt Street, yesterday afternoon, in the presence of a representative attendance. His Honor Judge Docker (president of the society), in opening the proceedings, explained that, owing to the unavoidable absence of his Excellency the Governor, Sir James Fairfax had consented to open the exhibition. There was a new departure this year, in as much as the exhibition was open to competitors from the different colonies. Consequently, there was a great increase in exhibitors, New Zealand being especially well represented. It would be found that some of the most valuable prizes had gone beyond the colony. But the society did not grudge these competitors their success. On the contrary, it welcomed them, for what had been lost in prizes had been gained in the comparison which would be drawn with their own work, and from the higher standard which had been shown. Sir James Fairfax, in declaring the exhibition open, referred to the fact that the society had been in existence for four years, and had held four exhibitions, each of which showed progress. It must be gratifying to see the exhibition so successful. It had been stated that photography was not a fine art, but he was of opinion that in order to produce the best, the operator must have a good idea of art. As an amateur photographer himself, and one who had taken a great interest in art, it gave him much pleasure to be present and open the exhibition. Mr Alfred Allen moved a vote of thanks to Sir James Fairfax, which was conveyed by his Honor Judge Docker. The exhibition of photos, was a very varied one, the entries being very numerous. 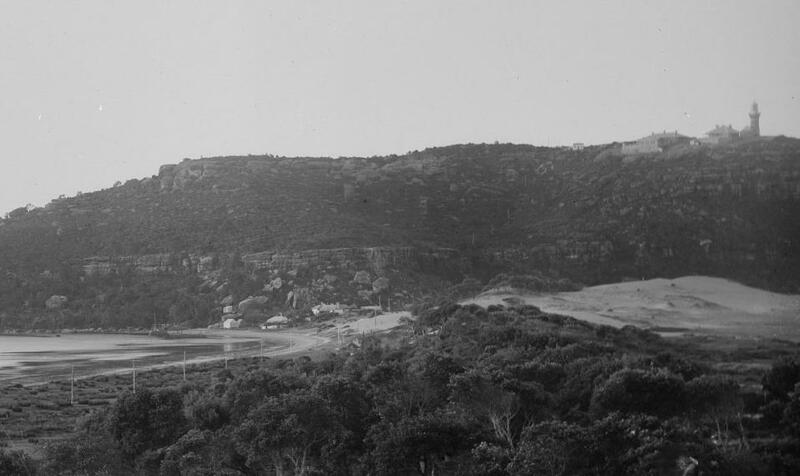 As it was open to intercolonial competitors, the following societies were represented: Dunedin Photographic Society, Queensland Amateur Photographic Society, South Australian Photographic Association, Victorian Amateur Photographic Association, Wellington Camera Club (New Zealand), Working Men's Photographic Club (Victoria), and the Austral Camera Club, Gulgong Amateur Photographic Society and the Photographic Society representing N.S.W. The judges were Messrs. Henry King, W. M'Leod and J. Brooks Thornley. Some very fine slides were shown and the gems of the exhibition were conceded to be 'The Smithy,' by Mr. J. 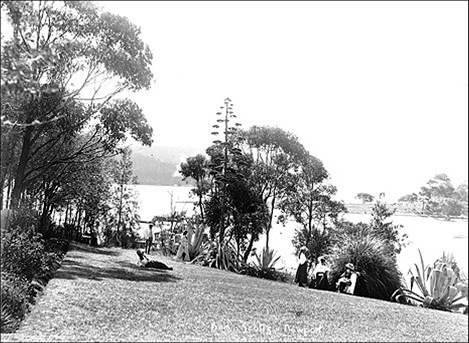 A. Higinbotham, Dunedin (N.Z. ); 'What Is It?' by Mr. R. Porteous, Working Men's College Club (Vic); 'Study in Color,' a yachting scene, by Mr. H.V. 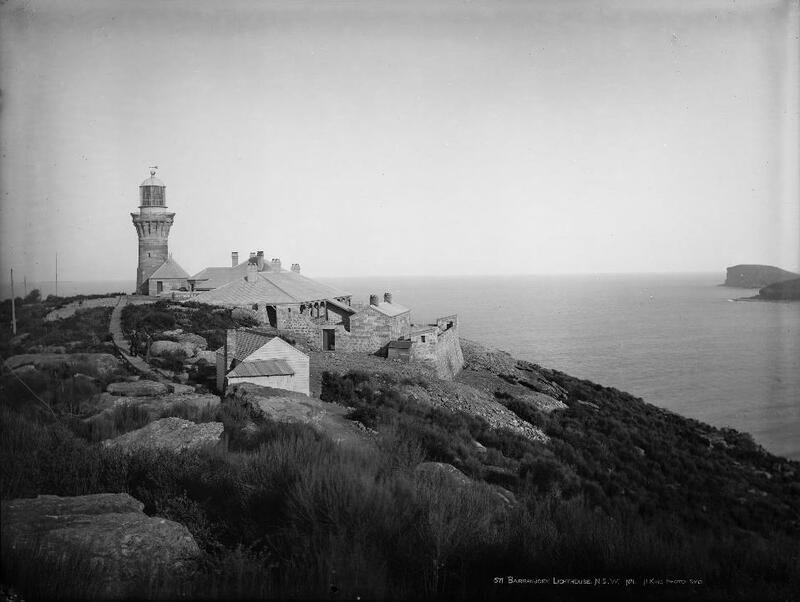 Lawes, Photographic Society of N.S.W. ; 'Flower Study,' by Mr. A. Hamilton, Dunedin (N.Z. ), and 'The Laundress,' by Mr, F. A. Joyner, South Australia. The last-named secured the first prize for the best carbon in the show. There was very keen competition in the landscape section. The office-bearers of the society are: Patron, Lord Beauchamp; president, his Honor Judge Docker; vice-presidents, Sir J.P. Abbott, and Messrs. C.G. Alford, F.T. Humphery, M.L.C., R. N. Kirk, and E. T. Davis; committee, Messrs. H. T. Blake, F.S. Copeland, Jas. Heron, L. Rolver, and M. V. Murphy; treasurer, Mr. J. M. Jago; hon. secretary, Mr Jas. S. Stenning; and assistant hon.secretary, Mr. T. de C. Lewis. 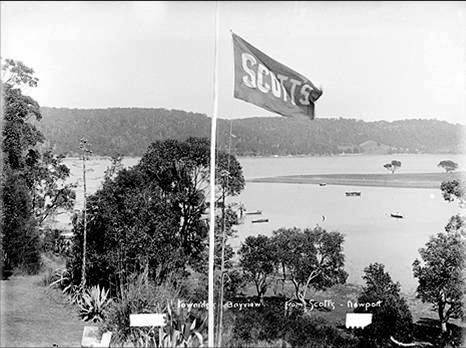 It may fairly be said that the tenth international exhibition of the Photographic Society of New South Wales which opened today at the Royal Art Society's Galleries, 78 Pitt Street, Sydney, surpasses anything of the kind yet produced in this State, if not in Australia. 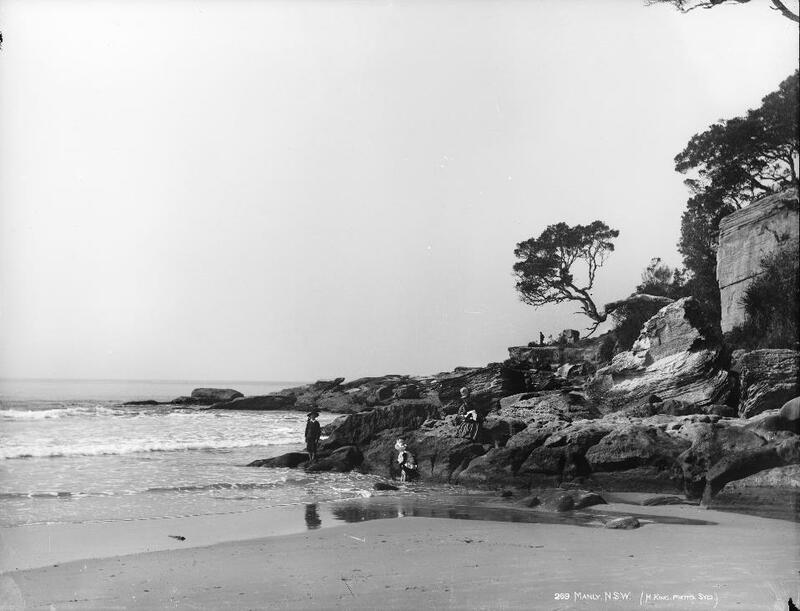 His success as a photographer eventually enabled him to build a large house in Wellington Street,Bondi which was called 'Rothelstone', with the beach only a few streets away. John King, of Swanage, owned a 'Rothelstone House' in 1880, indicating the name for the house he built was a tribute to where his parents brought him from. 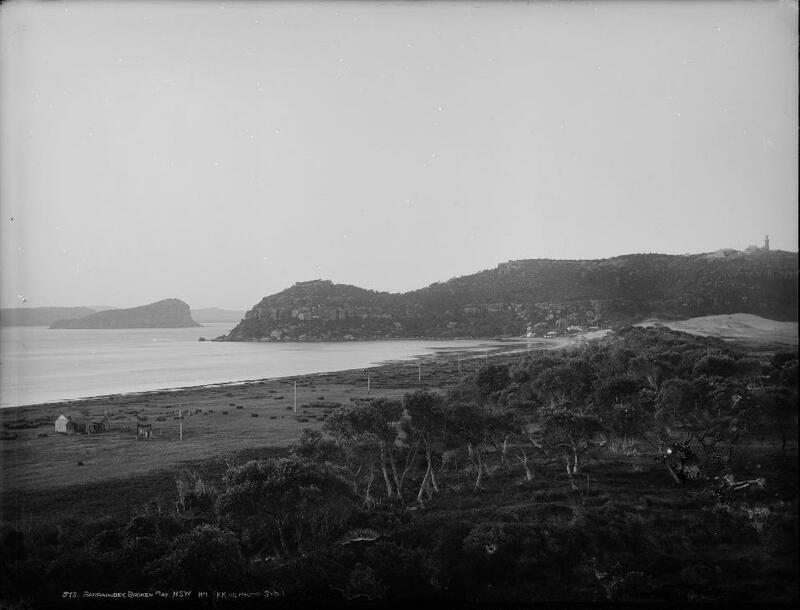 William J Hall (1877-1951) and his father, William Frederick Hall, both worked as photographers in Sydney in the late 19th century and early 20th century. 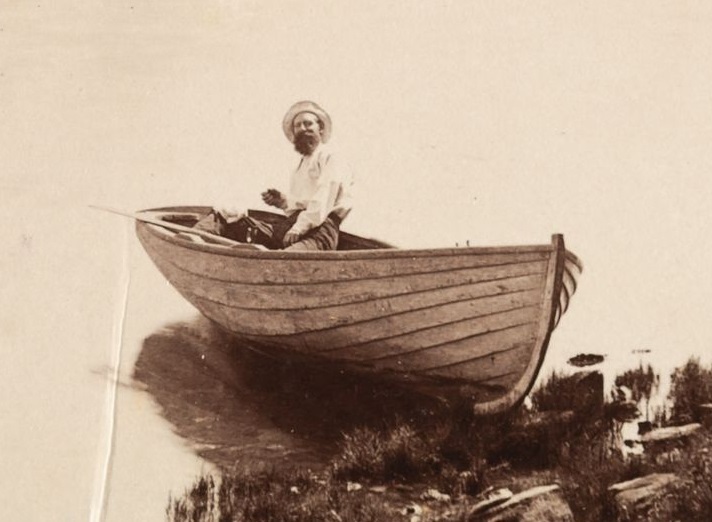 The extensive collection of their images contains portraits, places and many sailing scenes. 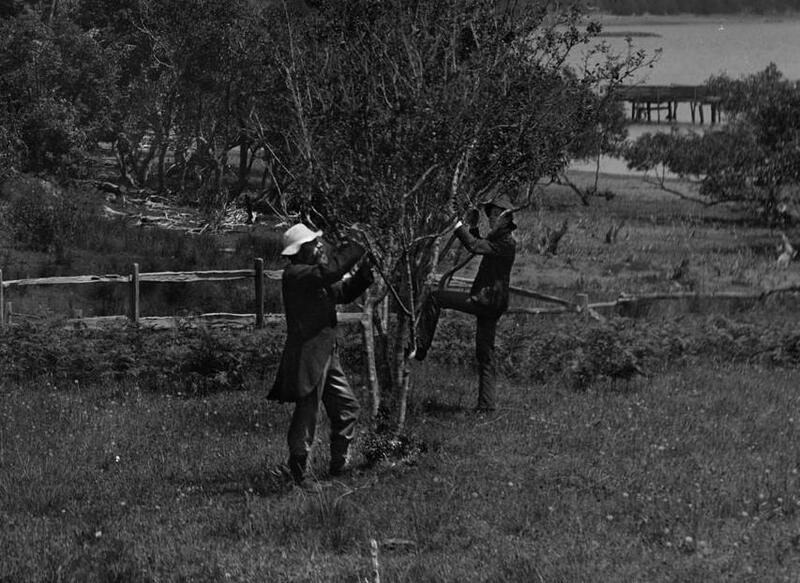 His clear support for other photographers, amateurs and professionals, lends speculation to who is in these photographs, as it is the same gentleman in both, that he took at 'Bay View' House on Crystal Bay Newport during the 1880's-1890's. That boarding house was then owned by David Scott, a photographer himself. The Scott’s bought the property and acreage from Benjamin James in 1886. 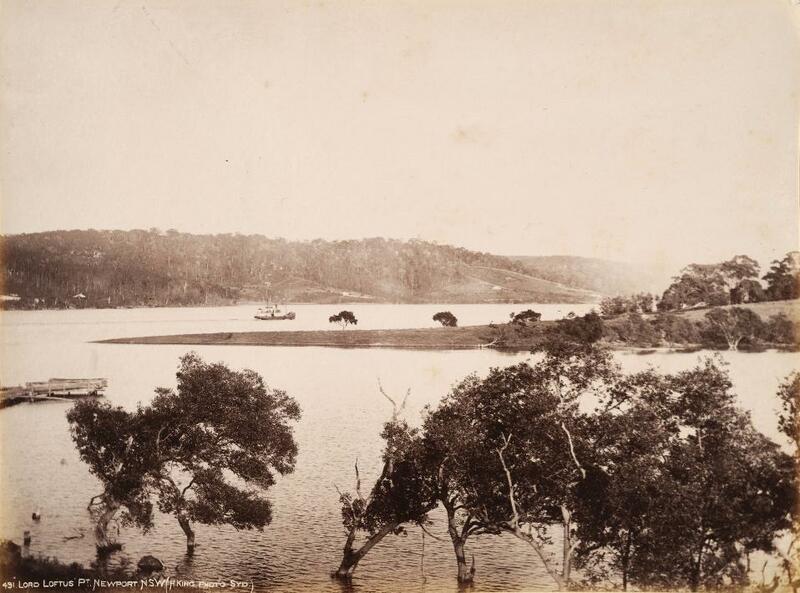 One way to draw visitors out from 'Sydney Town' was to have photographs of the premises and environs where they would see them. 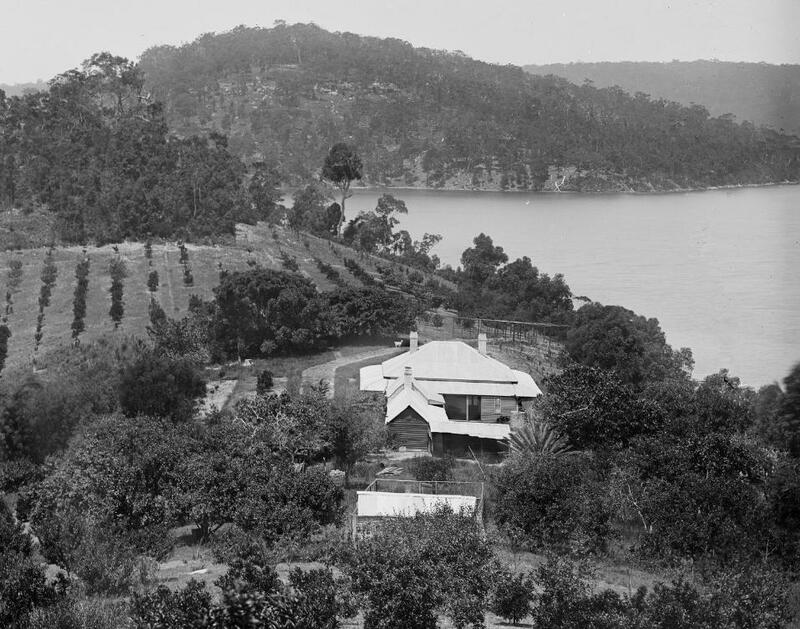 ‘Bayview House from Loftus Point, Newport, N.S.W.’, Henry King, Sydney, Australia, c. 1880-1900 - This photograph existing is perhaps a measure of the esteem and regard Henry King's photographs were held in by other photographers as the property he is photographing was owned by a gentleman who was also a portrait and landscape photographer. Dorcas and David had six children, two daughters who died, one in infancy and the other at nine years of age, and David J Scott 1861 – 1926, Herbert (Bert) Scott 1869 – 1934, Minnie Scott 1875 – 1956 and Leighton Scott 1879 – 1961. Is this his eldest or second eldest son in this photo with him? David Scott had previously worked as a portrait photographer in the city but may have moved his wife and family out here in order to help his wife, Dorcas Scott (nee Dickson) recover from an ongoing illness. 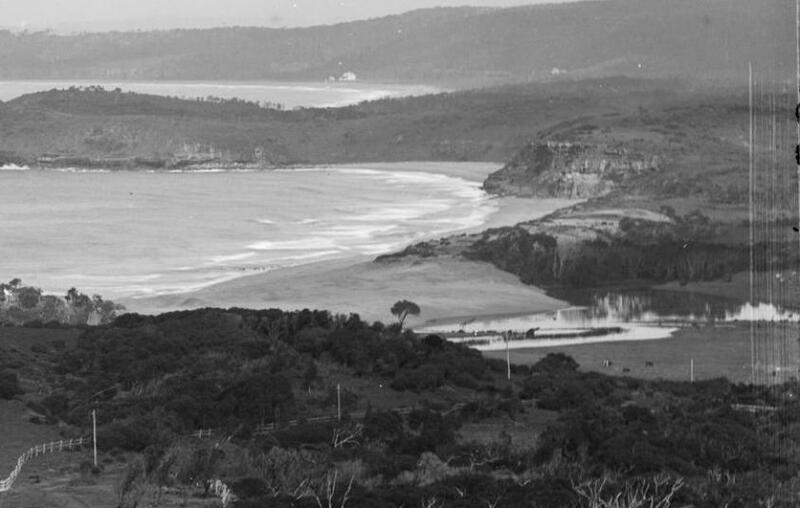 He continued taking photographs, including local events such as cricket matches at Mona Vale into the 1900's. professional photographer, trained at Edwin Dalton's Sydney studio in 1857, then opened his own photographic rooms in George Street in 1858. He took over William Bradley 's premises in Pitt Street in 1870 and remained there until 1891. In 1870 he advertised as Bradley’s successor and as the winner of a 'Prize Medal’ for coloured photographs at that year’s New South Wales Agricultural Society Exhibition. The plain and coloured photographic portraits he showed at the 1879 Sydney International Exhibition were awarded a highly commended certificate. 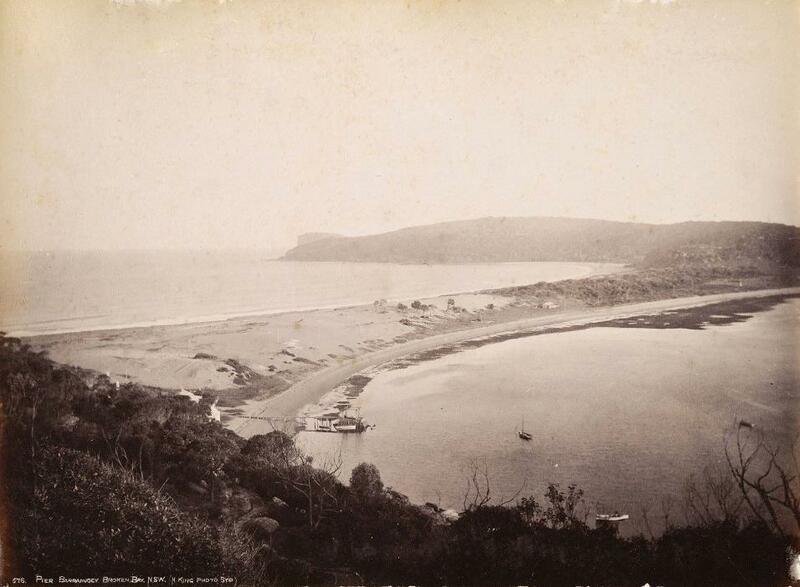 In 1885 he was producing dry-plate 'instantaneous pictures’ with a new camera weighing about 10 pounds (4 kg) which, he claimed, had 'a universal range of focus’ so that his photograph of the Double Bay Regatta, for instance, showed all the sailing boats and spectator craft sharply and clearly. Mr. FREEMAN begs to announce the completion of some important alterations in his Studio, more especially in the distribution of light, thereby avoiding the glare so frequently a subject of complaint ; and at the same time producing a more artistic and pleasing portrait. Mr. FREEMAN invites particular attention to his INSTANTANEOUS process, for Children and Nervous Sitters. Photographs enlarged and finished, in Oils, Water Colours, or Crayons. B. WILLIAM BRADLEY having sold his business to his old and valued friend Mr. DAVID SCOTT, has great pleasure in recommending that gentleman to his numerous patrons, and respectfully begs to assure them that Mr. David Scott will be certain to produce portraits in all reflects equal to those taken by himself, as, in addition to his natural taste and long experience as an artistic photographer, Mr. Scott is in possession of the entire formula and processes used by Mr. Bradley with such great success. And, in addition to this, Mr. Scott has been thoroughly initialed into the exact method of operating practised by Mr. Bradley, and having now taken all the portraits at the above establishment for the last nine months. Many of these portraits being finer than anything that has hitherto been produced in Sydney, Mr. Bradley trusts that this may be taken as a guarantee of Mr. D. Scott's great ability. In conclusion, Mr. Bradley begs to thank his patrons for their favours, to kindly bestowed upon him for so many years past. P.S. :The business will be carried on as usual under the same name of William Bradley, in order to avoid mistake. Sir,-In a report of the Fine Arts at the Exhibition, viz, photography, contained in this morning's Herald, terms of praise are attached to photographic portraits exhibited by a Mr. Montague Scott. I beg to state that it is an error, for if you will kindly refer to the Catalogue you will see that no photographs are exhibited by the above, The commendation was no doubt intended for me. As you will see by Catalogue, Class 495, No. 2536, that I exhibited both plain and coloured photographs, which have been highly commended by the judges, and as I have already suffered in my business through the mistake in the names, I will feel obliged if you will correct the mistake in your report to save me from suffering still further through it. BUIST and SON.-Pianofortes, harmoniums, concertinas, &c, tuned and repaired. 235, George-st. ESTABLISHED 30 years. Louisa Ewer, ca. 1871-1879 by photographer David Scott. 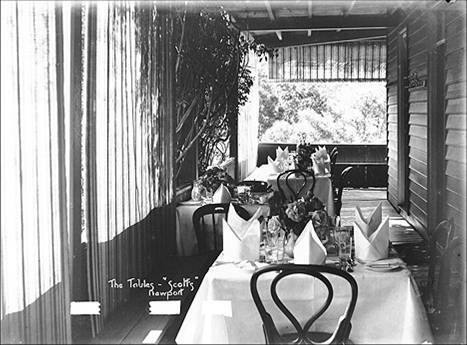 Image no a4215042h, courtesy State Library of NSW. On reaching Windsor by train about 11 a.m., at which hour the cool atmosphere is so refreshing, for which Windsor is so famous, I strolled down to South Creek, where willows line its banks, and under the shade of which the engineers under the direction of Captain Parrott constructed a pontoon bridge which spanned South Creek. The bridge was made of casks and miscellaneous timber, the whole structure being of sufficient strength to carry men and stores (as in engraving). I believe the bridge was never tested for carrying a load, but came in as practice for the engineers. During the morning (after parade), an arrangement having been made for an attack upon and defence of the camp, the attacking party, under the direction of the commandant, marched for open ground the defence force under the command of Lieut.-Colonel Wilkinson being left in the camp, and piquets shortly stationed for its defence, some of which took shelter in one of the trenches (see engraving) -which had been thrown up by tho engineers. Shortly afterwards guns were heard in tho direction of the railway. The defending party at once brought their guns into position to bear on the spot where the enemy had been discovered. As the attacking party, advanced steadily over the hill towards the camp rifle and gun shots were exchanged, becoming pretty lively, as may be seen detailed in the engravings. The right flank of the attacking party, bore on the left flank of the defending party the effort being made with strong force, but which was met by the two guns in camp. The artillery fire of the camp held the enemy in chock for a few moments, but they were overwhelmed by the enemy's infantry, and the invaders gained the day. The bugle was then sounded for mustering, and, after general salute, the troops dispersed to their different quarters for dinner and for cleaning arms. Another sketch shows some of the engineers at dinner, the centre gentleman doing the amiable to the loaf of bread, powder seeming to sharpen the appetite, if we may judge from the smiling expression on the different countenances. After packing up traps and departing for home by the evening train, an elderly lady beguiled us on our way by a lecture on the noise of those horrid guns, during which I fell asleep, which ended for the time being all remembrances of the Easter camp. 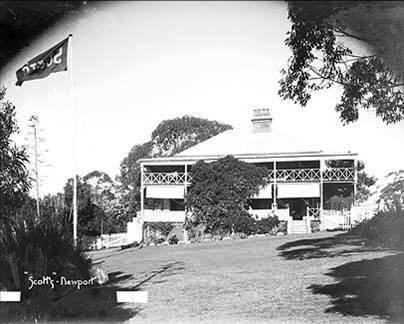 During the first two years of his proprietorship David Scott kept the name ‘Bay View House’ in all advertisements but advertised the property, and its ‘curative’ aspects as ‘Scott’s Sanatorium’ in the years 1891-1892. This may have been an appeal to the advert readers but also may denote his wish that his wife be cured. He also seemed to be in charge of renting another, smaller cottage. His daughter Minnie took over management of the premises when she was old enough. 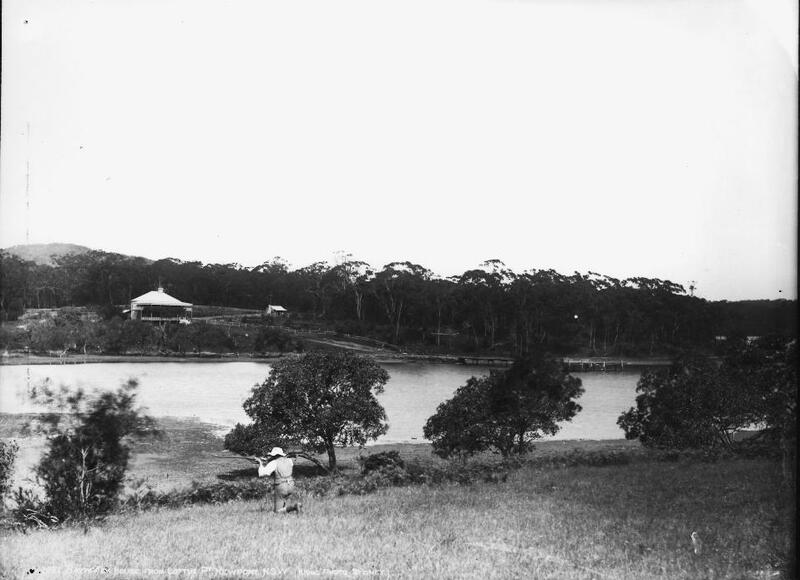 ‘Lord Loftus Pt, Newport NSW’. 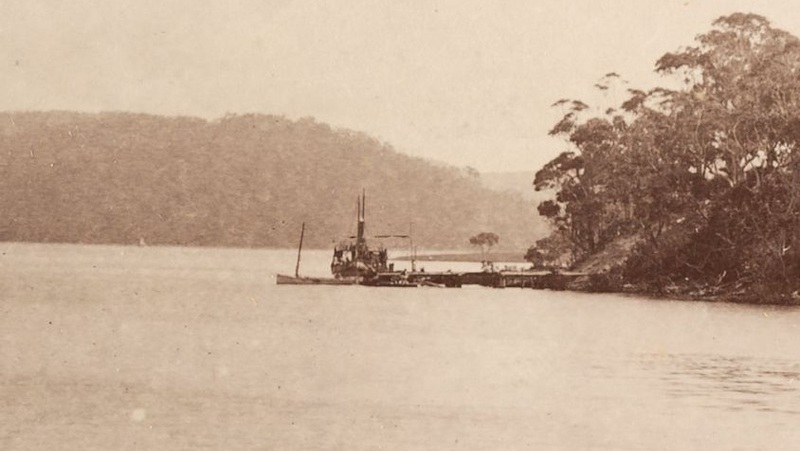 circa 1880 and 1900 - part of the Royal Australian Historical Society (RAHS) collection - the steamer may be the Florrie - launched 1879, or the Illawarra. 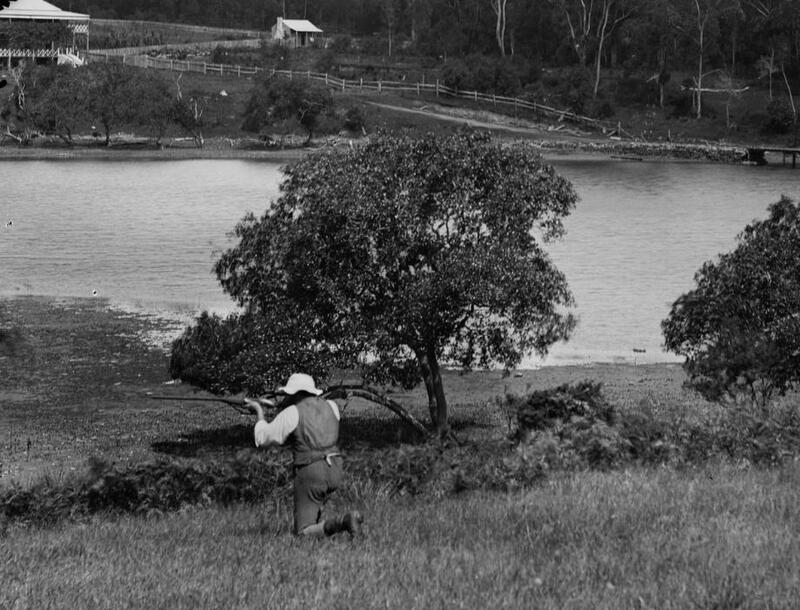 Compare this image by yet another Photographer of Early Pittwater - Charles Bayliss - that same man, in that same white hat! Newport, circa 1880-1890, by Charles Bayliss - and enlarged sections from. 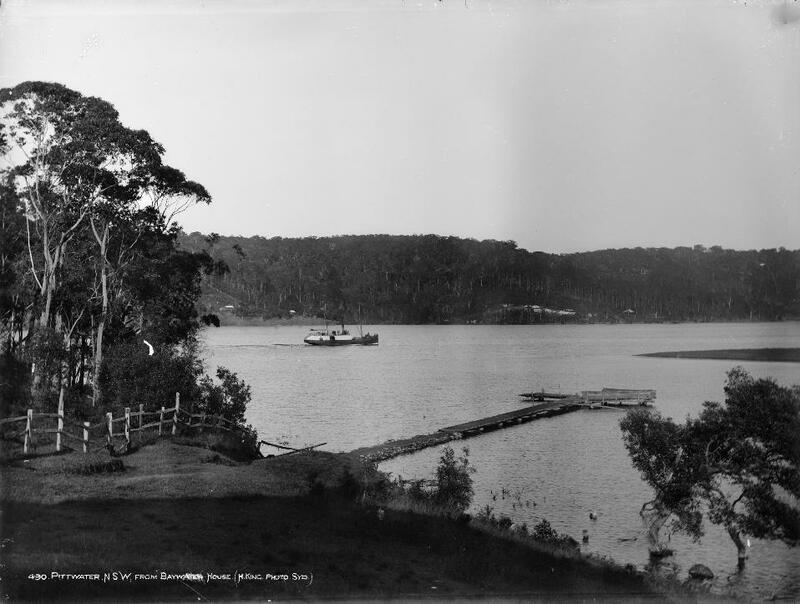 Part of the Royal Australian Historical Society (RAHS) collection - the steamer may be the Florrie - launched 1879 - or the Illawarra, which also brought excursionists to the Newport wharf. In fact there seems to be the likelihood that David Scott had Henry King and Charles Bayliss as guests on a few occasions during that 1880 - 1890 decade as much as working in George Street himself. Despite competition for commercial contracts and sales there was a fraternity among these photographers and who else was to take a photograph of them if not each other? While the sight of someone grinning straight at the lens makes you wonder if they're a relative - is this little boy, and girl and lady at Manly - part of Henry's own family adding some extra interest to this photograph he took of Manly for instance - is this Harry H (born 1886), Ivy L (born 1889) and Mrs. Elizabeth King? If so, that would date this image to the 1890's and give us one of the few insights available of King family life. Henry King died aged 68 in Waverley War Memorial Hospital on May 22nd, 1923 following abdominal surgery and was buried on 24 May in the Congregational section of Waverley cemetery. He was survived by his son and three daughters. After his death King's studio collection of glass negatives was purchased by J. R. Tyrrell and eventually by Consolidated Press Holdings. In 1975 an exhibition of his Aboriginal portraits was held at the Australian Centre for Photography. Factual and uncluttered by artistic effect, they were appreciated for their ethnological significance and the dignity of his subjects. KING.— May 22nd, at a private hospital, Waverly, Henry King, photographer, of 279 George Street, Sydney, dearly loved father of Edith, Harry, Ivy, and Dorothy King, of "Rothelstone," 22 Wellington Street, Bondi, aged 68 years. 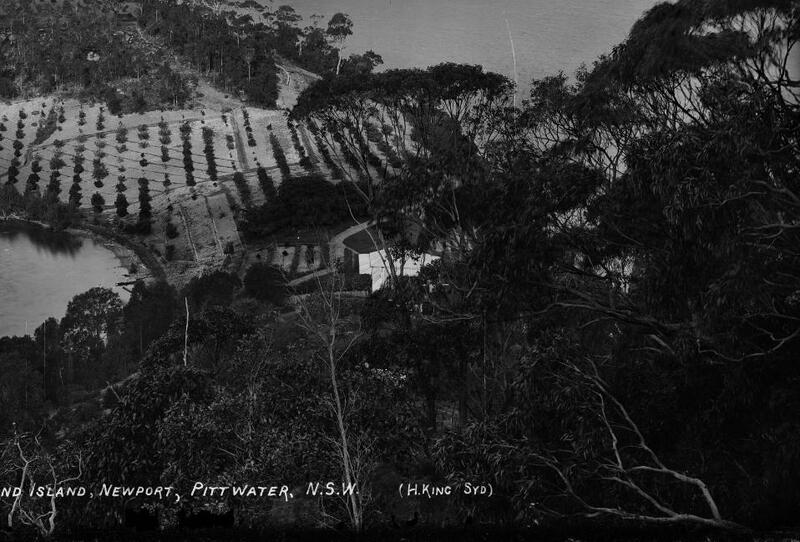 His landscapes of an earlier Pittwater are among the finest available and underline the importance of the work of our local Museums and State and National Libraries in housing, keeping and with the advent of the Internet, digitising these materials so they are available for all to see how this place was before all the changes that have taken place for those who like to see what came before them. Henry King's photographs still command high prices at auctions and through art dealers - a testament to his brilliance, even if he may have thought he was just 'doing his job'. We all remain fans - and small tributes such as this page, hope to bring home how precious the work of those who developed and encouraged this art form is. Studies and Thesis cited above. THE FRIENDS of the late Mr. ROBERT LAING, Sen., are respectfully invited to attend his Funeral ; to move from his late residence, 314, Crown-street, Surry Hills, THIS (Wednesday) AFTERNOON, at a quarter-past 2 o'clock, to Necropolis. C. KINSELA and SONS, 118, Oxford-street, and 757, George-street, opposite Christ Church. In the will of Robert Laing, late of Crown-street, in the City of Sydney, in the Colony of New South Wales, stonemason, deceased. NOTICE is hereby given, that after the expiration of fourteen days from the publication hereof, application will be made to this Honorable Court, that probate of the last will and testament of the aboreuamcd deceased may be granted to Robert Laing, James John Sutton, and Henry Daniel Welch, of Sydney, in the said Colony, gentlemen, the executors thereof.—Dated this 9th day of January, a.d. 1879. MR. FREEMAN'S LECTURE ON PHOTOGRAPHY. YESTERDAY evening, Mr. J. Freeman delivered, to a numerous and attentive audience, assembled in the Hall of the School of Arts, an interesting and instructive lecture upon " Photography - its Rise, Prowess, and Application : " illustrating his remarks by a variety of chemical experiments having an immediate bearing upon his subject, and explaining the nature and use of the apparatus employed for the present development of photographic art. A large number of beautiful specimens were exhibited and referred to by Mr. Freeman in the course of the lecture, in exemplification of the results of different processes, and as evidencing that perfection already obtained by skilful application of the photo-graphic principle. The lecturer commenced by giving a history of the rise, progress, and various applications of photography, for the benefit of those who knew that science only by its works ; having seen and admired its productions without understanding the means whereby it was worked, or the rationale of its various processes. This lecture was intended for the information and amusement of those who had not studied the subject ; not, as lectures on photography frequently were, for the instruction of students in the art. The lecturer proceeded to state that the science of photography was properly to be considered as an entirely modern invention, and expressed his reasons for dissenting from the opinion entertained by some that indications of an imperfect knowledge of it might be traced up to ancient times. The rapid manner in which the photographic principle had been developed and almost universally applied, was then illustrated | by a reference to the wonderful and manifold application of the powers of steam, as prophesied in the poetry of Darwin, and, as now, everywhere fulfilled. From its earliest birth Photography had, in its various branches, been rendered useful in elucidating other arts and sciences, and had been made largely subservient to the happiness of the social circle. Various experiments relating to the blackening properties of I salts of silver Lad been made previous'to the commencement of the present century by several philosophers, amongst whom might he mentioned Shecle, Gaueibier, and Rumford ; out no important advance towards the actual discovery of photography was made up to the year 1801, when Sir Humphrey Davy and Mr. Wedgewood turned their attention to the subject. At that time they first endeavoured to produce impressions from the camera obscura ; and Wedgewood, in the year 1802, published a paper in the journal of the Royal Institution, under "the title of " An account of a method of copying paintings on glass, and of making profiles by the agency of light upon nitrate of silver," with observations by Sir Humphrey Davy. The result of these experiments was, however, rendered abortive by their inability to produce any means for fixing the impressions. The possibility of copying objects produced by the solar microscope was at that early date discovered by Sir Humphrey. To that great philosopher, therefore, was to be attributed the honour of having invented the first application of photography to the arts and sciences. The lecturer then passed on to speak, of the discoveries of Daguerre and Nieper, by which the early visions of Davy and Wedgewood became realised as a fact, and such astonishing results obtained by the application of photography as would,' in the days of darkness and superstition,'have consigned the inventors to the Dungeon or the Stake. Daguerre obtained a large pension for making his process public, from the benefit of which England was excluded, Mr. Bland having purchased the exclusive right to the practice of the art in that country. Bland sold licenses accordingly for cities and countries to persons desirous ' of acquiring the right to practice the art. At that period the lecturer had been one of the licensees, having purchased the right for Somersetshire, where he first practised the photographic art. This exclusive right retarded the progress of photography in England, and years elapsed before it was superseded j but not before Mr. Egerton had spent a considerable amount of money in dispute as to its legality. The lecturer then reviewed the capabilities and general application of the daguerreotype process, pointing out its defects, and peculiar difficulties, and showing how the complication of the apparatus together with the expensive nature of the manufactured plates of metal required, presented obstacles to its adoption by amateurs. M. Claudet's invention of the photometer, and .the phocometer instruments for ascertaining the correctness of focus, and the relative degrees of intensity of light, was then touched upon ; and mention was made of the series of experiments made for the purpose of converting daguerreotype impressions into engravers' plates by means of different acids aided by galvanic batteries. The daguerreotype, however, in spite of every thing, was found to be more fitted for the (production of miniature portraits than for the advancement of other applications of the art. The sister art of photography upon paper (instead of metallic plates as in the daguerreotype process), was then treated of by the lecturer. In 1839, Mr. Fox' Talbot, after a series of elaborate experiments, published in 1839, the valuable result of his scientific researches. The power of re-production on paper of photographic pictures was, in-' deed, extremely important. The Talbotype, which owed its existence to the genius of Mr. Fox Talbot, was possessed of all the best and most material advantages of the art. In delicacy of tone, however, it was after-wards surpassed by the Collodion process. The lecturer then entered into an interesting and lengthened description of the different processes thus developed, and their respective peculiarities and defects... The perfection of the photographic process was arrived at through the discoveries of Mr. Scott Archer, scarcely any attentions having taken, place since the modifications which he introduced. The lecturer then explained at length to the audience the principles of the Collodion process, showing the action of rays of light on the various chemical agents employed, what those different agents were, and the manner in which they were severally used. This portion, of the lecture was extremely interesting and instructive, although of such a nature that it would scarcely be possible to make it intelligible unless, fully reported. Having familiarised his hearers with, the uses and properties of test-tubes and -chemical solutions, negative pictures, the process of positive printing, the use of photographic printing frames ; Mr. Freeman next dwelt upon the application of the microscope to' photography, and exemplified its extraordinary and beautiful results. Amongst these illustrations ,was produced the representation of a parasite found, existing on a beetle-too minute to be visible to the naked eye, but by the unerring aid of microscopic; photography elaborately drawn about as large as a man's hand. The application of photography to astronomical purposes (in which Mr. Warren de la Hue had proved so successful) was then fully described, and discussed, and enlarged photograph of the moon shewn and handed round to the audience. Amongst the wonders of photography, none were more productive of amusement and instruction than the stereoscope. This little toy of science, the joint production of Professor Wheatstone and Sir David Brewster, had, Mr. Freeman observed» opened a very wide fîeld for the photographer, the many uses to which it was applicable, being'such as would occupy some considerable time to enumerate. The lecturer then explained the principles of, the stereoscope in concise and .simple terms, and after-wards eloquently expatiated upon the practical'uses of all the different applications of photography. Amongst those he mentioned and exemplified the litho-graphic process and Paul Pretsch's photo-galvanic, process. Photo-lithographic maps made for the Surveyor-General's office at Melbourne in two or three hours, and reproducible ad libitum, were shewn as proofs of what could be thus effected. After entering into a variety of other features presented to him by his subject, Mr. Freeman briefly made a few remarks on the photographic pictures which were exhibited in the hall-amongst which, by the kindness of Mr. Clark, were the beautiful photographic reproductions of Raphael's celebrated cartoons. The lecturer concluded by a spirited eulogium upon photography, not only as applied to the practical purposes of everyday life, but also, when properly studied and practised-as on important branch of intellectual art. A vote of thanks was given by acclamation, at the conclusion of the lecture, and Mr. Freeman was for some time surrounded by a large number of those who had been present during the lecture, and who were evidently much interested by the objects he then exhibited and explained to them. The gentleman from Boston was Mr. P. M. Batchelder. He established himself in Collins-street east, and his portrait rooms in a very few years became a household word throughout Victoria. The daguerreotype portrait was quickly superseded by the portrait on glass, known amongst photographers as the collodion picture, or positive. The process was entirely new. It was unlike the daguerreotype in all its stages-the materials used being every one essentially different. This revolution in the photographic business left heaps of the old practitioners in the rear, new men taking the lead : many of these to be again beaten out of the field by a far greater revolution soon to follow-that which remains in force to the present day, and which appeals likely to remain an institution for many years to come. In all these changes Batchelder kept the lead, having the art of seeing skill in others, and being quick to avail himself of it. During the positive era, our first Parliament under the new constitution was elected. It was in contemplation by Mr. W. Strutt, an excellent artist at that time residing in Melbourne, to paint a grand historical picture of the opening of that Parliament, and for this purpose Batchelder volunteered to photograph every member of both Chambers, together with all the officers of Parliament, the foreign consuls, the military officers, and others taking part in the ceremony. Some scores of photo-graphs were thus taken, all of a large size, but the work became so formidable that Mr. Strutt despaired of making it profitable, and abandoned the labour. Batchelder's collection long formed the great show of Collins-street. All who heard of it went to see it. The portraits formed a highly interesting gallery. The collection is still almost entire, a great portion of it being carefully preserved by the Hon. J. P. Fawkner, and the remainder in the possession of the proprietor of Punch. When we entered the reception-room we spoke of life-sized pictures. This curious fact in photography is one of recent growth, and the process deserves some explanation. A negative of the ordinary kind is taken and put into a camera, very much as a dis-solving view is placed in a lantern. The sun is directed through the lens of a large magnifier by means of a reflector, and the image on the negative is thus thrown on to a screen. On this screen is spread the pre-pared paper which receives the image, or it may be reflected on to canvas. The figure being enlarged to the size required and fixed on paper or canvas, is then passed over to the artist of the establishment, who treats it in any manner required by the person who orders the picture. The painted portraits we saw were the work of a professed portrait painter, Mr. J. Botterill, a gentleman of over twenty years' experience in his art, and bequeathed, as it were, by Mr. Strutt to all the first educational establishments in Melbourne when that gentleman decided upon returning to England. Mr. Botterill has now retired from the practise of his profession, except in connexion with the firm of which he is now a partner ; and the miniatures, kit-cats, and other portraits painted by him, whether in oil, water-colour, or mezzotint, fully deserve what they are receiving-a wide reputation.